The pendulum lounger for relaxing power naps. The first lounger that moves to relax you. Power napping – renew your energy in your sleep! All you have to do is close your eyes. SWAY, the new lounger by KLAFS, does the rest, rocking you into a refreshing nap with its gentle pendulum movement. Within seconds, a pleasant, cosy feeling envelops your body and your mind begins to let go of everything; soon, you won’t even notice the rocking movement. Instead, the pendulum frequency is cleverly gauged to help your body and mind relax completely. Even though the time is too short for a deep sleep phase, 15-20 minutes is quite sufficient to leave you feeling totally refreshed. You’ll find it easier to concentrate, be more productive, and return to your daily work with renewed energy. No matter what time of day it is. Studies conducted by the Fraunhofer Society have shown that the pendulum movement of SWAY enables users to relax considerably faster than on a conventional lounger. Sleep is one of the best relaxation techniques in the world. A quick nap during the day helps your body to regenerate, improves your powers of concentration, performance and reaction, and lowers your risk of a heart attack. 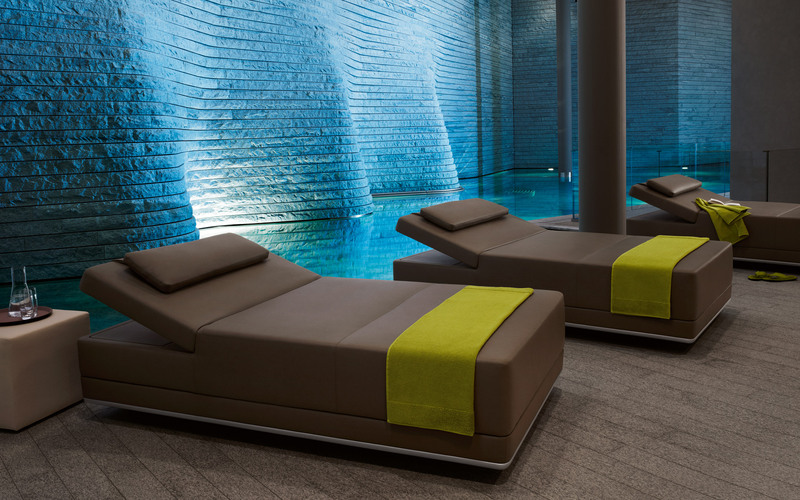 Thanks to its unique pendulum movement, this lounger is an effective way of pampering your body and soul. With the motor and the adjustable feet concealed invisibly beneath the lounger, you not only feel as though you’re floating on air – it looks like it, too. And thanks to the adjustable feet, the lounger has a firm and secure footing on any floor. In order for the lounger to blend harmoniously with its surroundings, you can choose a cover to match your colour scheme and style of furnishing. Our soft, textile leather is extremely robust and easy to clean. Bespoke craftsmanship and the high quality you can always expect from KLAFS guarantee that you’ll be able to enjoy SWAY not just for 15 minutes, but for many, many years to come. As elegant as it is functional: the adjustable head rest can be lowered or raised at the press of a button – via the remote control which also controls the pendulum function. Our in-house experts collaborated with scientists from the Fraunhofer Society to perfect the motor and substructure of this lounger. As a result, the motor runs virtually noiselessly – helping you to relax even more deeply. Ingenious safety concept: the German TÜV (Technical Inspection Association) was highly impressed with the Safety Stop mechanism in the aluminium-coloured trim, which not only looks stylish, but also offers maximum safety. The new pendulum lounger for your home, on which you can forget simply everything for 15 to 20 minutes. Proven to help you relax faster thanks to the special pendulum movement. Contemporary, timeless design in the colour of your choice. Bespoke craftsmanship and the high quality you can always expect from KLAFS make SWAY a truly exclusive addition to your home. Handy remote control and ingenious safety concept. Besides saunas and a wide range of sauna accessories, KLAFS also manufactures the SANARIUM®, whirlpools, infrared heat cabins and steam baths. To ensure you enjoy your sauna for many years to come, KLAFS offer a 10-yr guarantee on privately used saunas and a 5-yr guarantee on sauna heaters and sauna control panels. In order to create durable saunas with an optimum climate, we pay extremely close attention to the quality of our materials and workmanship when it comes to sauna woods. We take our responsibility towards the environment seriously, and have been sourcing our wood sustainably for many years. This is reflected, for example, in the environmental seal of approval we received from the IHD (Institute for Wood Technology) in Dresden for our real wood veneers – the first ever to be awarded for sauna wood. In all our saunas, the seats, benches, backrests and headrests are made from softwood, which is ideally suited to this purpose. On request, we also use poplar wood. We’ve also invested a great deal of time and effort in the construction of our sauna heaters – the heart of any and every sauna. These are controlled via user-friendly sauna control panels, which also regulate any accessories and optional extras. The sauna control panels allow you to create your perfect sauna environment at the mere press of a button. And their backlit displays enable you to keep an eye on all key data – temperature, humidity, time, warming-up phase etc. Nowhere else on the sauna market will you find such user-friendly technology. Each and every KLAFS sauna has a personality of its own, but in some respects they’re all alike – each combines quality wood with quality workmanship; each is officially certified (RAL, VDE & GS certificates); and each privately used sauna comes complete with a 10-yr on-site guarantee. So you can relax with total peace of mind.